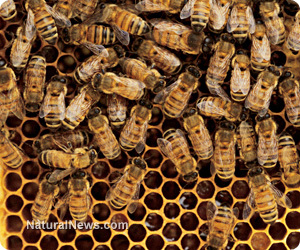 (NaturalNews) The immune systems of honeybees are being compromised. Bees are being slaughtered in droves. Piles of these pollinators are gathered by the handfuls at farms across the Western Hemisphere. This isn't a small-scale problem that the bee populations can easily adapt to and overcome. This has been a growing problem since 2006, when commercial bee colony collapse was first observed. Now, beekeepers consistently report an average loss of one-third of bee populations each year. This isn't the complaint of some poser environmental cause. This travesty is affecting each and every person on the planet in tremendous ways. Without honeybees, important nutritious vegetable crops cannot be pollinated. Without honeybees, one of nature's most valuable antibiotics -- honey -- falls into limited supply. Important medicinal resources like beeswax and bee propolis are becoming scarcer. Honeybees play an integral role in a healthy human experience. The honeybee fallout comes at the hands of people who invest in chemical manufacturers -- most significantly, pesticide manufacturers. The speculation over the dangers of neonicontinoid pesticides is over. New findings from scientists in Italy suggest that neonicotinoid pesticides exert a molecular trigger in honeybees that damages their immune response. By compromising the bees' immune system, the chemicals make the pollinators more susceptible to viruses. As a synthetic nicotine chemical, these pesticides are intended to destroy the nervous system of insects like aphids; however, this study breaks new ground, showing how these pesticides exert an immunosuppressant effect on honeybees. The study, led by Francesco Pennacchio of the University of Naples Federico II, identified a specific gene in the honeybees containing a code for a protein that regulates immune response. This leucine-rich repeat (LRR) protein family is responsible for suppressing activities of a key protein involved in immune signals. When a class of neonicotinoid pesticides called clothianidins was applied at sublethal doses, the LRR protein was expressed at increased levels, ultimately suppressing the immune system pathway of the honeybees. Another class of neonicotinoid called imidacloprid had the same effect on the bees' immune system. In contrast, an organophosphate insecticide called chlorpyrifos did not signal the LRR gene codes, leaving the bees unharmed. Therefore, clothianidin and imadacloprid scientifically suppress the honeybees' immune system. When the scientists exposed the compromised bees to a common field pathogen called the deformed wing virus, the virus replicated unchecked, overwhelming the bees' immune systems. When no neonicotinoid pesticides were applied, bees were much healthier and could ward off the deformed wing virus more effectively. To make matters worse for neonicotinoid pesticides and their primary manufacturer, Bayer CropScience, a new report finds that these honeybee-harming chemicals don't even help farmers improve their crop yields. The Center for Food Safety compiled new evidence showing how this class of pesticide actually fails to improve crop yields on a consistent basis. In some instances, the pesticides have an opposite effect, attacking the wrong insects that are needed to control the aphids! As the go-to pesticide in America, neonicotinoids are doused on the 170 million acres of GMO corn and soybean crops across the country. This insect neurotoxin is absorbed by the growing crop and becomes chemical warfare for insects and spiders that are naturally present in the field. The Center for Food Safety review included 19 scientific peer-reviewed studies that evaluated whether the pesticides were effective for increasing a crop's bushels-per-acre yield. In the conclusion, 11 studies were inconsistent and eight showed no improvement in crop yields at all. The most telling example of failed crop yields was explained by Jonathan Lundgren, an agricultural scientist at the North Central Agricultural Research Laboratory in Brookings, S.D. In the peer-reviewed study, two different kinds of soybean seeds were planted in opposite fields. One was coated with pesticides, and the other was not. For two years in a row, the crop yields were evaluated. Both crops yielded generally the same amount of soybeans. After studying the insects affected, Lundgren found that the targeted aphid wasn't even harmed, since the pesticide dried up before the bug appeared in mid-July. The pesticide actually targeted the wrong insects. Ladybugs, lacewings and spiders that prey on the aphid were affected the most. In trying to control the natural world, the pesticide actually had the opposite effect, killing the aphid's predators, allowing the bug to go unchecked and do more harm to crops. In summary, the Center for Food Safety's attorney Peter Jenkins said, "In most cases they [neonicotinoids] are totally unnecessary and are causing tremendous harm." Mr. Jenkins represents beekeepers and is taking on the EPA to address the environmental challenges imposed by neonicotinoids.